When JFK took office in January 1961 he inherited several foreign policy hot-spots from the Eisenhower Administration. In Europe, Berlin was the focal point of the Cold War. Just off the coast of Florida, Cuba appeared to be an enemy in our midst. And in Asia, tiny Laos was in turmoil. But it was Vietnam that haunted JFK throughout his time in office, right up to the last week in November 1963. As he gazed out the window from the Oval Office that cold January day Kennedy saw the creeping vine of communism spreading across the globe. On the home-front he could anticipate an uphill fight to quell the seemingly unending chorus of “soft on communism” accusations leveled against his party by Republican adversaries. But this president was not going to be pushed around. After all, had he not always talked tough to the “Reds”? Had he not made the missile gap with the Russians his key foreign policy campaign issue? And hadn’t all this helped get him elected President of the United States of America!? It was high-time for a change in the way the Democrats were seen in the public eye, ie, that they couldn’t be trusted to protect the country, and it was going to be JFK who would finally turn the tables on the right-wing antagonists. At least that was the hope. Little did Kennedy know, the honeymoon wouldn’t last. It wasn’t long before the President was handed a Bay of Pigs invasion plan designed to topple Fidel Castro. In an oft repeated ritual, the new, green, president was immediately approached by intelligence officials and spooked into supporting an ill-fated plan that already had considerable intelligence momentum behind it. Kennedy was ripe for the picking, and it would cost him, but he learned an early lesson that greatly influenced his interactions with the intelligence services to the end. Laos and Vietnam both had communist insurgencies actively being faced by American CIA elements in the field. In fact, when JFK and Ike met to pass the baton, it was Laos that rated advice from Eisenhower not Vietnam. Nevertheless, Ike and his Secretary of State, John Foster Dulles, had played a key role in getting the US involved in the quicksand that was South Vietnam. In 1954-55, following the French surrender at Dien Bien Phu and subsequent peace treaty, CIA agent Edward Lansdale was dispatched to Saigon to assess the situation on the ground. Lansdale judged that the best hope for the survival of an anti-communist South Vietnam was Ngo Dinh Diem, who at that time was emerging as the victor in a power struggle with the French installed Bao Dai. Lansdale recommended to the fervently anti-communist Dulles that the US support Diem, a devout Catholic, by sending him millions of dollars in aid, which Eisenhower promptly approved. Lansdale remained in Saigon for a time, working alongside other US agents, to assist the Diem government as it slowly, and sometimes brutally, consolidated its power base. For a fine account of the feel of this period in Vietnam read Graham Greene’s The Quiet American. What we were trying to do in South Vietnam was twofold: first, the US was logically carrying out it’s foreign policy of containment whereby Soviet and Chinese Communist expansionism was to be checked, using limited warfare and diplomacy, wherever it broke out; second we were attempting nation building, plain and simple. South Vietnam had no real tradition of independent nationhood. In fact, democracy was totally unknown there. But suddenly, with US backing, Cochinchina (as it was called during the French period) had become South Vietnam and it was an independent republic, yet it had only been five years since the French had left. To lend legitimacy to the enterprise the American Government had been sending diplomats over, we sent doctors and humanitarian aid, we sent police consultants, we sent money, lots of money, and of course we sent intelligence agents—the quiet Americans. So, to recap, when Kennedy arrived on the scene he was looking at communist insurgencies in Laos and South Vietnam, but his attention first and foremost was on the situation in Europe, especially Berlin. He had an emboldened CIA breathing down his neck to approve the Bay of Pigs operation to take out Castro, and he was of course facing the traditional bludgeoning tool of the Republicans– their persistent cry that Democrats “lost China” because they are soft on Communism, and hence can’t be trusted to keep the country safe. In reality, inaction in South Vietnam was not a viable political option for him. On 16-17 April, 1961, the Bay of Pigs debacle took place. Then in June the young president faired poorly in his first summit with Soviet Premier Nikita Krushchev. Shortly thereafter, in June of 1961, Diem formally requested U.S. Military advisors on South Vietnamese soil. Kennedy believed that another failure on the part of the United States to gain control and stop communist expansion would fatally damage U.S. credibility with its allies and his own reputation. Kennedy determined to “draw a line in the sand” and prevent a communist victory in Vietnam, saying, “Now we have a problem making our power credible and Vietnam looks like the place”, to James Reston of The New York Times. After reviewing the situation in Vietnam, JFK called on retired General Maxwell Taylor to go to Vietnam, investigate, and then consult the President on next steps. Taylor was already a war hero by that time; he had dropped behind German lines at Normandy and he had commanded the 8th Army in Korea after Matt Ridgway. While serving as the Chairman of the Joint Chiefs for Eisenhower Taylor became disillusioned with the trend toward strategic bombing and air force centric government funding, prompting him to write The Uncertain Trumpet, a detailed critique of Eisenhower’s strategies and his support for the policy of mass retaliation. The book greatly impressed JFK. General Taylor accepted Kennedy’s charge honorably, like the good soldier that he was, and set out for Vietnam, along with Defense Secretary Robert McNamara. It didn’t take long for the two of them to come to the mutual conclusion that there was a pretty dangerous insurgency in motion that was steadily getting worse. It was much worse than either had anticipated. What to do? Taylor knew President Kennedy wanted a low-profile in Vietnam, but he also saw that things could get away from our viceroy Diem quickly without some sort of action. Taylor, a true believer in limited warfare, started small by recommending that we provide ARVN with three companies of helicopters and some Air Force Air Commandos. Kennedy bit. So in December 1961 the first Army helicopter units arrived in Vietnam. By the end of 1962 U.S. Army aviation “advisors” were cutting edge– especially when it came to the helicopter gunships—UH-1, or Hueys. (note: by 1963, there would be 16,000 American military personnel in South Vietnam, up from Eisenhower’s original 900 advisors). It will be beneficial to pause here and take a quick look back at the recent history of the insurgency. In 1959, after an internal power struggle over military strategy in Hanoi, the Communists moved to take the fight openly to the enemy and ordered military dau tranh in the South. By 1960, elements of the People’s Army of Vietnam (PAVN) were operating in South Vietnam and we saw the birth of the 9th Viet Cong Division. In April of 1960 North Vietnam announced conscription. In December 1960 the National Liberation Front (NLF) was founded and proclaimed itself the shadow government of South Vietnam. The NLF was the political front for the insurgency against Diem while the Viet Cong, supported by PAVN, provided the military muscle. Throughout the remainder of ’61 and ‘62 there were plenty of skirmishes, neither side really gained much of an edge though. The relationship between Kennedy and Diem, although sometimes strained, continued to cement. For the most part the NLF spent the time doing organization building and stage-one operations, namely the establishment of secure base areas, propaganda and recruitment among the villagers, infiltration of police and civic institutions, and build-up of arms stockpiles throughout the countryside. Diem’s oppressive policies, strategic hamlets being the latest outrage to many villagers, continued to create fertile ground for NLF recruitment. But the NLF and their benefactors in Hanoi knew that prospects for success dimmed with each escalation of American involvement, they desperately needed a morale boosting victory on the battlefield not just to prove to themselves that they could fight and win, but also to prove it to the villagers who are the ultimate prize in revolutionary warfare. That brings us to January 1963 and the battle of Ap Bac. It came at a time when both sides were hungry for a decisive victory to galvanize their fortunes. As mentioned, the Viet Cong were particularly anxious for something to kick-start an insurgency that seemed to be losing some steam in light of American involvement. The key American figure in the battle was a guy name John Paul Vann, an Army Lieutenant Colonel, and the senior advisor to 7th ARVN Division assigned to the lower Mekong Delta, a breeding ground for guerrillas. Vann was a no nonsense intense tough soldier who pushed the ARVN commanders to take the fight to the Viet Cong. Vann was a decorated veteran of the Korean war and he had volunteered for action in Vietnam. In the battle for Ap Bac the commander of the 7th ARVN was Colonel Bui Dinh Dam. 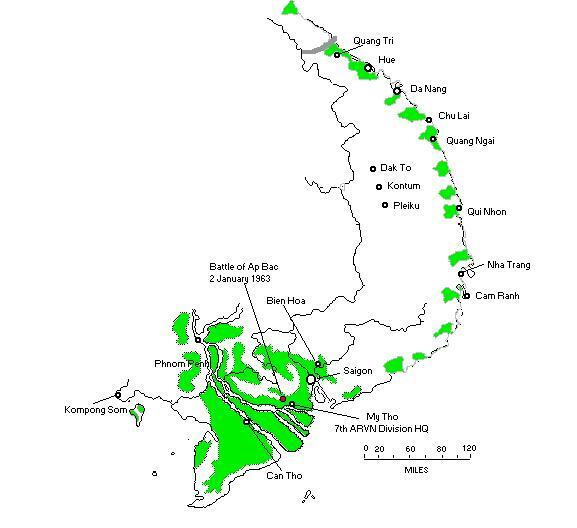 Major areas of wet rice cultivation in green. Note the short distances. Ap Bac is only 38 nautical miles from Tan Son Nhut Airport. That was only about fifteen minutes flying time for the C-123s that dropped the paratroops. John Paul Vann’s military philosophy was straightforward: find the Viet Cong and destroy them. Easier said than done. How do you find an adversary that is masterful at concealing its whereabouts and movements? Even when you did locate a squad they were experts at breaking-off contact, disengaging, and melting away into the jungle before they could be taken. The solution was stealth, speed, and overwhelming firepower. Helicopters were perfect for such missions. But you can’t hit what you can’t see and the VC consistently thwarted most attempts to draw them into a pitch battle out in the open. It was frustrating. Finally, Vann got a break when his outfit intercepted a VC radio transmission that indicated that communist troops, elements of the 261st Viet Cong Battalion, were in Ap Bac. Vann’s reaction was pretty much what you would expect from a guy itchin’ for a fight– based on that single flimsy piece of intelligence he lobbied Colonel Dam hard, finally persuading him to commit his 7th Division to a multi-battalion attack, scheduled to kick off near dawn on January 2, 1963. With the time difference factored in most Americans were just finishing up their new years day festivities when Vann’s plan went into action. If I’m not mistaken, I believe that USC and Wisconsin played a memorable game in the Rose Bowl that day. On the other side of the world the Hueys and M113s hit the rice fields near Ap Bac. In his capacity as a US military “advisor” to ARVN Vann requested that thirty H-21 helicopters be assigned to the operation for troop airlift, supported by five UH-1B helicopter gunships. He also asked for Air Commandos on call in reserve. For his part, Colonel Dam committed two Civil Guard battalions from his regional forces and from his 7th ARVN division, he committed an infantry battalion and a company of thirteen M-113 armored personnel carriers (APCs). The M-113 was an armored box on tracks with an exit ramp at the rear for the eight infantrymen it normally carried. There was a driver and a gunner and a .50 caliber machine gun mounted on top. It was amphibious and therefore could navigate in flooded rice paddies. In addition, Colonel Dam held two infantry companies in reserve at Tan Hiep airfield. Finally, Dam requested, and received, a parachute battalion in support of the operation. Vann would call the shots for the operation from above in the back seat of an aircraft. Vann’s attack plan was complex, it would have been difficult even for the most seasoned military outfit to pull it off. The maneuver championed by Vann was what is called a triple envelopment: the two Civil Guard battalions were to be transported by truck to a position where they would attack Ap Bac from the south. The 7th ARVN infantry battalion would be ferried by helicopter into attack positions to the north of the village and the M-113s would attack through the rice fields from the west. The parachute battalion would be held in reserve to be dropped to the west of the village to cut off the Viet Cong’s escape route. Not only was the plan a challenging one, but it was fated to suffer from the same old bugaboo that has doomed many a worthy operation over the centuries– bad intelligence. 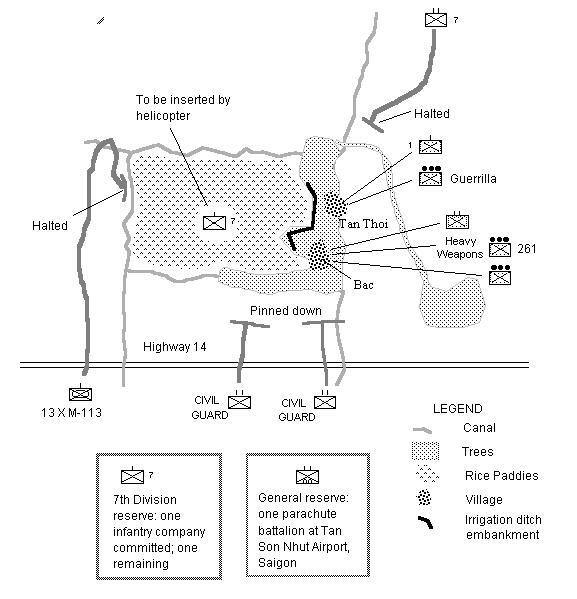 Disposition of Communist Forces and 7th ARVN Division Plan of Attack: the above map reflects the actual Viet Cong order of battle and the Allied plan of attack developed by Lt. Col. John Paul Vann in his capacity as senior American advisor to Colonel Bui Dinh Dam, 7th Division commander. Note that Vann had no actual command authority over any of the Allied tactical units involved. Ap Bac is in IV Corps, some thirty-five miles southwest of Saigon. Continuing to look at the map above it becomes apparent that the actual Viet Cong order of battle was not what Vann and Dam anticipated. Remember Vann’s shaky intelligence? It had indicated that Ap Bac was occupied by little more than a company of the 261st Viet Cong Battalion. Wrong! 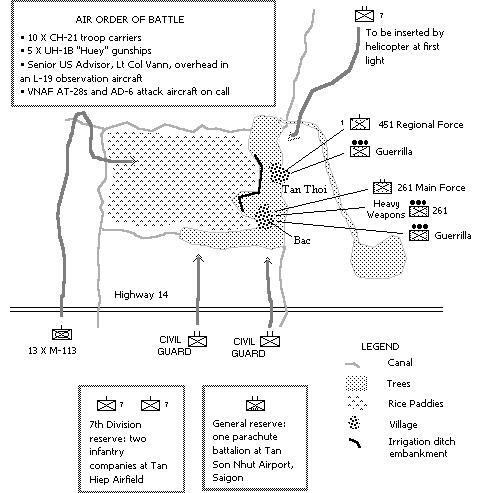 In fact, the entire 261st VC Battalion was in Ap Bac and neighboring Tan Thoi, and what’s worse, they were reinforced by a heavy weapons platoon. The operation would get off to a bad start and Vann had not bothered to draw-up a contingency plan. Big mistake. Something almost always goes wrong in warfare, it’s up to the commander to try to anticipate what it will be, and come up with a plan for dealing with it. Carl von Clausewitz called it friction, by which he meant all those factors that prevent orders from being carried out as they were intended to be. As you can see from the order of battle on the map, friction began to manifest itself even before the operation jumped off. For instance, recall that Vann was expecting thirty H-21 helicopters for his initial lift, instead he got only ten. That meant that the battalion slated to attack Ap Bac from the north wouldn’t arrive on time, and therefore the ground attack from the North would be delayed. To add to ARVNs woes, during the night, the Communist commander in the village received reports of heavy equipment and road traffic in the area. He promptly ordered his men to be on their guard. So Dam and Vann had lost the element of surprise and didn’t know it. The 261st VC were good troops and they were well entrenched. The VC commander set up his defenses on and around the dikes that reached out into the paddies—the men dug machine gun bunkers into the dikes. By dawn, they were waiting for the attack, ready for action. And this time there was a different dynamic to the fight; unlike in the past when the VC had the tendency to break contact and disengage when the going got too tough, this time the communist commander at Ap Bac had direct orders to stand and fight, no matter the cost. They simply had to have a victory, especially over the dreaded helicopters, if they were to maintain any credibility with the populace on whose support they depended so heavily. There would be no cutting and running. It became clear immediately that the fates were going to have their way with Vann and Dam that day. Events began badly and then quickly spiraled out of control. To begin, the Civil Guards that were placed south of Ap Bac became pinned down behind an outcropping of trees that stood between them and the village. A thick fog rolled over the battlefield just in time to hinder the first troop lift of the 7th ARVN into the area north of the village. Remember, Vann’s timing for the lifts was already bankrupt due to the lack of H-21s, now it would take even longer to move the soldiers into place. Fog as friction. The operation was on hold until the haze lifted. The upshot: the attack from the north wasn’t ready to jump off until 0930. Back on the south side of Ap Bac the Civil Guards were still pinned down, hence they weren’t performing their operational support roles. Unknown to Vann the Civil Guards weren’t actually under the control of Dam, instead, because they were some of Diem’s best anti-coup forces they had been entrusted to a Diem loyalist, the local province chief, with orders not to commit them in battle. Vann’s failure to understand and navigate the intricate workings of the South Vietnamese political and military structures had come back to bite him, the operation was already at great risk. And it hadn’t really even started yet! Again, he had no plan B, and by mid-morning everything was off schedule and none of the troop formations were where they should have been. And what of the M-113s, where were they? Also not where they were supposed to be. They were commanded by a captain (named Ba) who as it turned out was also tacitly controlled by the same province chief who had been dragging his feet to commit Diem’s Civil Guards. Predictably, in hindsight, as you might expect he didn’t want the M-113s damaged either. So there they were, armored personnel carriers crucial to the success of Vann’s operation, just sitting in place going nowhere fast. They (the M-113s) had moved as far forward as the last irrigation canal short of Ap Bac and then stopped, cold. Things were quickly going from bad to worse. Vann, in a scene reminiscent of General Walton ”Johnny” Walker at the Pusan Perimeter in Korea, shouted and pleaded over the radio as he circled in the spotter plane above. He watched helplessly while Captain Ba’s M-113 APCs sat, parked, just short of the edge of the assault radius. But what could Vann really do? He had no real authority over any of the troops. Troops he had staked his entire operation on. I wonder if it crossed his mind at that moment that his plan may have been too complicated to begin with? Whatever the case, it was clear by then that the thing was unraveling in an accelerated fashion and Vann really had no power to turn it around. His actions from that point forward resemble those of a man plunging from a cliff, grasping in desperation for any ledge or extended branch that might somehow break the fall. Catching a life-line in such dire straits is a rare occurrence indeed, as Vann was to discover throughout the rest of the day. His next move was to call in some air strikes by the A-26s, which did little to help his fading cause. He then requested one of the ARVN companies in reserve be committed to the fray. He ordered his helicopters to insert the company in the middle of the rice paddies west of the village 350 yards out in the paddy, out of range of the small weapons fire that came from the dikes, but close enough to mount a lightning charge under covering fire from the Huey gunships. But you guessed it, the helicopters weren’t his either. This time it was an inside job, these helicopters, and their pilots, were on loan from another US advisory unit. Now things begin to get a bit murky, and the argument over what happened next is still alive to this day. 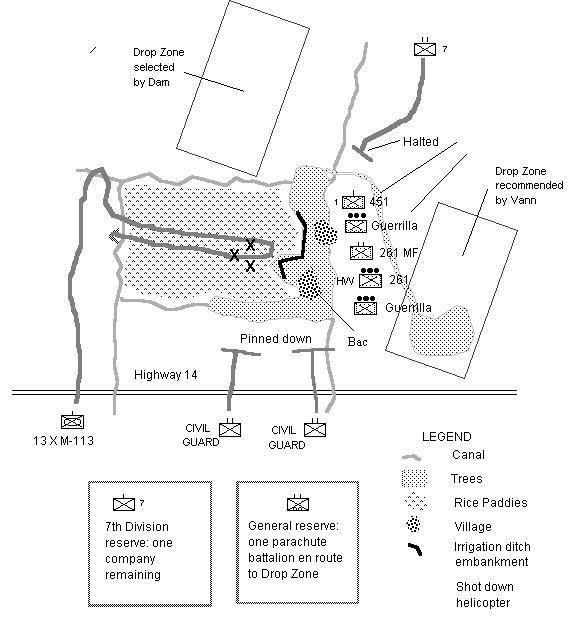 According to Vann’s telling, the helicopter formation leader disregarded orders and took the reserve company closer toward the defensive formations in the dike, approximately 150 yards out, leaving the squadron vulnerable to the heavily fortified automatic weapons in the bunkers lining the dike. The H-21s came under a hail of fire; one was immediately shot down and crashed into the rice paddies; another was seriously damaged but managed to flutter away and land nearby, it was out of action. The rest of the H-21s turned and fled before delivering their human cargo. Then the H-21 squad commander turned and attempted to rescue his downed crew and he was shot down. Seeing the disaster unfolding before him, the leader of the supporting Huey gunships opened up and made a daring pass to cover his downed brothers—and he too was shot down. Vann was looking at four helicopters on the ground burning in a matter of minutes. When the pictures hit the world press it had the effect of cold water to the face—the little insurgency in South Vietnam had now exploded onto the front pages—America’s “engagement” there had taken a shocking twist—the brush-fire war was headed for the big time. The pictures of the downed helicopters in the rice paddies are now quite famous, you will see them in practically any photo-documentary of the war. But the disaster wasn’t over, not by a long-shot. It wasn’t even noon yet! Obviously, at this point, the situation was dire, to say the least. At crucial moments like this, in the heat of a battle, calmer heads must prevail if anything resembling success is to be salvaged. Unfortunately for the “good guys” Vann was anything but cool. ARVN troops were pinned down in the rice field and south of town. First he called in another futile air strike by the A-26s, then, in a state of panic mixed with seething anger, Vann threatened to have the ARVN Captain, Ba, shot on the spot if he didn’t immediately send the M-113s forward into the rice paddies. Left with no other choice, Ba ordered the APCs into the fight. It was approximately 1:30pm when they went in. The M-113s had a big advantage because the Viet Cong forces didn’t possess anti-tank weapons, their machine guns alone couldn’t have stopped the onrushing ARVN armored troop transports, but it’s unclear whether Ba’s forces knew that at the time. At any rate, standard operating procedures for armored infantry was to stay inside the APCs right up to the last possible moment, they weren’t trained to drop the rear ramps to disembark until they were right on top of their objective. Riding on top of the APCs were gunners with .50 caliber machine guns charged with covering the infantry once they jumped from the vehicles. So in they went, the communist fire was intense, and the .50 caliber gunners were exposed and completely unprotected. It didn’t take long for them to crack and run for cover, the ARVN gunners scrambled to retreat inside the vehicles. Then as fate would have it Captain Ba, who was orchestrating the attack, was knocked unconscious. Now the M-113s were driving blind with no contact with a functioning commander. The drivers kept going forward until they reached the forward edge of the Communist infested dike. At this point the infantry troops were supposed to jump from the APCs and attack under the cover provided by the machine gunners, but those gunners were no longer in position and nobody was in charge. The soldiers inside the vehicles, listening to enemy rounds pinging off their armor, refused to leave the immediate safety of the vehicles to attack. They just stayed there, like sitting ducks. Then, all at once, the Viet Cong troops rose from the trenches, with machine guns blazing, and charged the stalled APCs. This was something new. In the past the Viet Cong, worried about taking heavy losses in an open fight against American firepower, had been content to settle for inflicting some casualties before melting way into the jungle to fight another day. Not this time. Not only had they been ordered to stand and fight, but now, seeing how things were shaping up in their favor, they were obviously emboldened and smelling blood. The Viet Cong weren’t going to act like guerrillas this time—they were poised to put the hammer down on the ARVN and Vann. Shocked, and with their commander out of action, the APC drivers turned tail and beat it on out of there fast. The Viet Cong was on the verge of the major victory that their cause so desperately needed. Game, set, match? Not quite, although in reality the fight was over. Vann, true to his bull-dog reputation, refused to give up. He was grasping at straws, and he must have known it. Even so, he was not going to go down easily. Remember the parachute battalion held in reserve? Vann, in a last ditch attempt to turn the tide, requested that they be committed. The request was approved, but by now the Viet Cong, having won a huge symbolic victory, were getting ready to break contact. In their eyes the time was right to quit while they were ahead. They began moving out of Ap Bac to the east as darkness began to descend. Vann, with his bird’s eye view, saw what they were doing and tried to get Dam to order the parachute battalion dropped in their path to seal off the escape route. Dam wasn’t about to go for it—he was not about to send in one of President Diem’s elite units, which would have incurred heavy casualties, to an engagement that was all but lost. He knew his career probably would not survive if the paras were wiped out. So he played both ends against the middle and gave the order for the paratroops to drop into the originally agreed upon drop zone– west of the village! Dam had opted to play it safe. But of course, in this whirlpool of misfortune and pitiful execution, even this seemingly cautious action turned bad when the drop was bungled and the paras, who were supposed to land out of small arms range, fell smack-dab in the middle of the rice paddies. Needless to say they were pinned down by the Viet Cong rear guard. Lucky for them though, the VC were on the way out of town and let them off the hook once the sun went down. Flying overhead, Vann was in a state of rage. It had been a bad day. In the aftermath of the debacle at Ap Bac John Paul Vann accused the South Vietnamese soldiers of incompetence and cowardice and US reporters printed his charges. Many reporters, Neil Sheehan in particular, considered Vann to be a moral hero who was risking his career to get the truth out. Sheehan was one of a crop of young reporters who came to Vietnam in the early years. They covered the war vigorously and quickly perceived that the MACV press office wasn’t coming clean about the difficulty of the fighting. Vann, on the other hand, was a straight shooter in their eyes who was willing to do the right thing by telling the truth about things, like how ARVN wouldn’t fight and how reports were being falsified to paint a rosy picture of the situation. You can read all about this in Sheehan’s book A Bright Shining Lie. Whatever the truth may be, one thing is clear to me– Vann badly overreached himself at Ap Bac. His plan was too complicated and would have taken inspired leadership plus pinpoint execution to be pulled off as intended. So, who was responsible for defeat? Also abundantly clear is that the communists, the NLF and Viet Cong, considered the battle of Ap Bac a major psychological victory. They were right. In the rear-view mirror we can see that it was a key turning point in the war. It resonated throughout Southeast Asia and America for years to come. What had been portrayed by western media and politicians as a rag-tag band of guerrillas took on the firepower and expertise of the mighty US Army, along with their ARVN understudies, and whipped them. Four helicopters shot down in five minutes! Maybe even more important, it provided stark proof to millions of villagers who were fed up with the Diem regime that the Viet Cong were not only on their side, but were ready, willing, and able to fight for them. The NLF could be counted on. It was a major psychological victory. For Diem and Kennedy it was all downhill in Vietnam after the debacle at Ap Bac, and both men would be dead within the year. The war would then spiral further out of control and the Vietnamese and American peoples would suffer through one of the worst tragedies of the 20th century. History surely would have taken a different course had events played out differently at Ap Bac, to what extent we will never know. What we do know is that the Communists led by Ho Chi Minh ultimately prevailed in the war with the U.S. They took control of South Vietnam, and united the country. The Battle of Ap Bac, fought on January 2, 1963, was their first important military victory along the way. Sheehan, Neil. A Bright Shining Lie. Karnow, Stanley. Vietnam: A History. “No political leader could go on indefinitely alienating one major social group after another and expect to survive. Yet that is exactly what Diem did. This description of the battle significantly distorts Sheehan’s account of the battle in A Bright Shining Lie. At the end of the battle on January 2, 1963, South Vietnam: 83 dead and more than 100 wounded. United States: 3 dead and 8 wounded 5 helicopters shot down, and 9 helicopters damaged. Vietcong suffered 3 casualties. Various accounts differ slightly on numbers but these are close. This was political battle, no way for ARVN winning. If ARVN was good, how the US troops could get in for something else?